I'm slipping back to Hollywood for a week, just because, I miss it! And this movie is too fun. It doesn't take long to realize I'm a Cary Grant fan. I won't list all the reasons why, but this movie was a great addition to my viewing repertoire. The basic set up is that Cary Grant's character is at court to have his wife declared legally dead seven years after she disappeared at sea. Then he promptly marries wife two. As they are at court, long lost wife one shows up at home. What follows is a comedy of errors that made me think of Parent Trap on occasion. Cary Grant is great as the befuddled and confused lead. 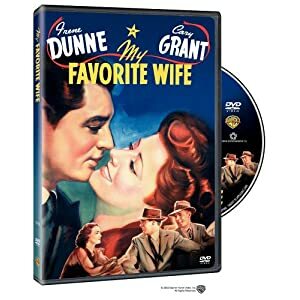 And Irene Dunne does a great job reeling him back in. I felt sorry for wife #2, but not too sorry. So if you're looking for a classic that has romance, comedy, and some great lines, pop this one in. LOVE old movies like this, Cara! James Garner and Doris Day did a remake in the sixties. If you haven't seen it yet, Dunne and Grant also teamed up for Penny Serenade--wonderful story! Ah, Cary. No one today compares!